Brian Hunt sent in this one. 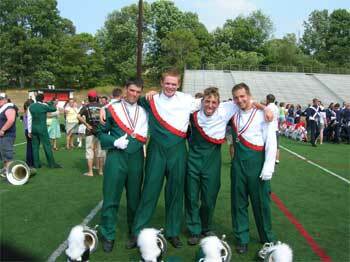 "This is a picture from grand finals retreat of the 2004-2005 East Coast Jazz lead baritone section (from the left: Eric Poster, Mark Maguire, Tony Gross, and I). "All four of us marched together in '04, and it ended up that all four of us came back to ECJ for the '05 season (though that was up in the air for awhile). Unfortunately, we won't all be able to march together again (Eric Poster is an '05 ageout), but that may be good, as by the rest of the season the rest of the baritone line was getting a little tired of our egos (Our running joke was that we had the snares and lead trumpets beat out for most arrogant section of the drum corps). "I had a great time marching next to and joking around with these guys all season, and I can only hope to be part of a section like this next year." Thanks Brian! E-mail your best shots from the summer to dave@dci.org along with where and when the photo was taken. Send some biographical information about yourself as well. We'll give you full credit. Also, let us know if you want your e-mail address included.